Michael Savage Sabotaged for Covering Hillary Clinton’s Health-Truth! & Fiction! - Truth or Fiction? 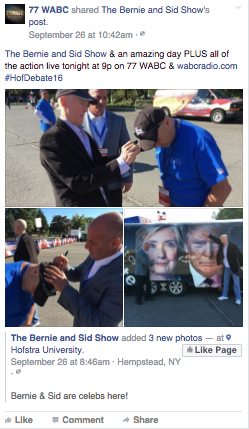 Michael Savage Sabotaged for Covering Hillary Clinton’s Health-Truth! & Fiction! Michael Savage, host of the right-wing “Savage Nation” radio show, was suddenly taken off air in the middle of a discussion about Hillary Clinton’s health. “Savage Nation” was pre-empted for live coverage of the first presidential debate on WABC, a New York affiliate of Westwood One radio network — but the decision doesn’t appear to be connected to his coverage of Hillary Clinton’s health. I spent 30 minutes talking about Hillary’s health problems; I read you every fact about it. I then read you the pharmacology of Levodopa, which is the main drug for Parkinson’s, and right in the middle of that discussion of Levodopa and its side effects, I was cut off across the country. Pure sabotage. No advance notice from me or my producers. Then ‘ISDN problems’ during my discussion of the side effects of Levodopa, used for treating Parkinson’s. Then the two fill-ins trying to sound informed and clever from WABC who have 40% lower ratings than me, boasting on air during my hours that they conducted a ‘coup’ by taking Savage off the air. It should also be noted that conspiracy theories about Savage being censored started almost immediately after WABC made the announcement on Facebook at 10:42 a.m. on the morning of the debate, with people commenting “Where’s Savage” and “Stop Censoring.” It appears the conspiracy theories about censorship had taken off well before Savage tweeted about it nearly six hours later. And the idea that Westwood One or WABC suddenly decided to silence Savage for talking about Clintons health on September 26th doesn’t make a lot sense since he’s been talking about it for weeks without being censored. A quick glance at the show’s archives shows that he spent extensive time on September 12 on August 22 without interruption. Donald Trump Will Skip Remaining Debates if Hillary Clinton is There-Fiction! United Nations Orders U.S. to Pay Reparations to Black People-Truth! & Fiction!